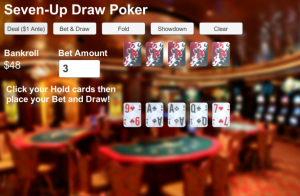 I made a Draw Poker sample game and included my Finite State Machine under the hood for orchestrating the action. It is a Seven-Up poker variant, meaning the deck is restricted to the highest-ranking 32 cards (7s through Aces). Odds of making a highly-ranked hand like Straight/Flush/Full House are better than with a 52 card deck. The game is a 1 player game vs. an AI dealer.